This has been a Tory standard for some time: the reason unemployment rates are down so much is because Labour is putting everyone on sickness benefits. Unfortunately the stats don’t support this claim. 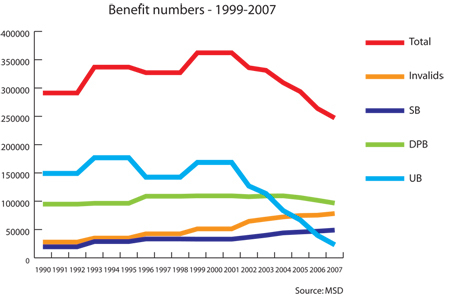 Here’s a graph showing trends in benefit numbers between 1990-1999 under National, and 1999-2007 under Labour. You’ll note that even with our growing and aging population putting pressure on sickness beneficiary numbers there is no marked increase since 1999, and certainly nothing to account for the drastic fall in unemployment. In fact, if you adjust the figures to population, sickness beneficiary numbers increased 51% under National compared to just 33% under Labour. Collins has a research unit to tell her this kind of stuff. She just knows you don’t. That’s true about the stat’s not showing unemployment is simply down by transferring people to sickness/invalids benefits. I think what that Belgium doctor described would be a fairly widespread difficulty though, particularly for rural/small town GP’s. Judith Collins used this against Darren Hughes today at Oral Question time. He replied that in his electorate of Levin, over 1000 more people now have jobs, while only 36 have moved to sickness benefit. I can only assume Judith Collins is persisting with this line of questioning as a marketing tool for the National party, the evidence doesn’t stack up. The link is to Collins talking about GPs being pressured into assisting people onto sickness benefits – I can confirm this does indeed happen in certain parts of the country. I can confirm this does indeed happen in certain parts of the country. Always has. All doctors know this. Look at the numbers. At most there are about 50,000 SB’s. Lets hypothetically guess that fully 50% of them are malingerers… ie all of about 25,000 individuals amounting to about 0.8% of the total workforce. It’s not the biggest issue facing the country, and hell if we have to pay these good for nothings a benefit to keep out of our faces, it’s probably money well spent. Now it would be really nice if we could get the number of freeloaders down to zero, if for no other reason than it might mean could afford to be more generous with the genuinely disabled… but you and I know this is not going to happen under any government you or I would care to live under. I have no doubt that some GPs have felt pressured like that Belgian doctor says, but Collins is trying to project the idea that this is the norm when it’s simply not true. That’s because people are on sickness benefits because they are sick, not because they’re rorting the system or being pushed onto it by the government to massage unemployment figures as Collins has so frequently argued. I would suggest that the malingers are at the most in the 1000s not the 10s of thousands. While some of my colleagues in primary care are a pushover most know a scam when they see it. Just beat me to fixing your typo, Tane. Who thought those roles would be reversed. In fact, if you adjust the figures to population, sickness beneficiary numbers increased 51% under National compared to just 33% under Labour. The proportion of the working aged population receiving a Sickness Benefit at the end of March trended upward between 1999 and 2007, but has decreased in the last year. Which stat is more important? The stat that is most important is the huge decrease of people on the UB, compared to the slight increase of people on the SB. Hence it doesn’t follow that National can accuse Labour of massaging unemployment figures by moving people onto the SB. .. well not all of the unemployed, anyway. Just a lot of them. And not just the sickness benefit, either, the invalids benefit too. One could be forgiven for thinking the assault on public servants in the Herald and beneficiaries in the DomPost on the same day is National’s attempt to distract voters and the media from that party’s lack of released policy and loss of initiative after the Cullen Budget that left them speechless. Show us yer policy, John! Stop bullying the weak. And why not? 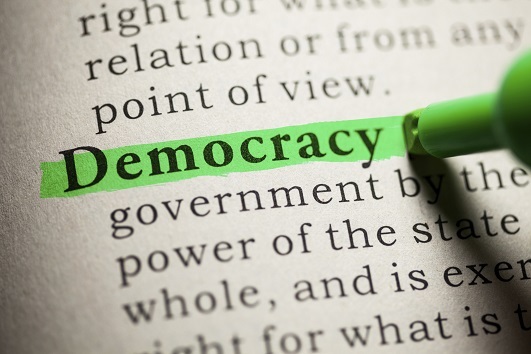 To the list I’d add people of any race, social status or religion, who passing as a ‘beneficiary’ cheats the new Zealand taxpayer by being a bludger. Te welfare state should be reformed, so only people in real need can have access to benefits. It’s been a free ride for too long for too many people. No it hasn’t. The stats right in front of you show it hasn’t. The growth in poverty in the 1990’s that hasn’t been properly dealt with show it hasn’t. In fact you moron, any measure of reality shows it hasn’t. But reality doesn’t mean that much to you does it, eriktard? You dull little creature. My God, that’s a brilliant idea! Why has no-one thought of this before? What have these lazy-arsed govts over the decades been doing, ignoring such a simple and obvious solution? Redlogix makes a good point: It’s not the biggest issue facing the country, and hell if we have to pay these good for nothings a benefit to keep out of our faces, it’s probably money well spent. Indeed. There is a proportion of lazy, useless, criminal, trouble-making fucks in any society, and I’m entirely happier for them to be off congratulating themselves for fraudulently drawing a minimal benefit at our expense somewhere, rather than applying for jobs with me and lying to my face in job interviews. Actually, I know quite a few changing from the unemployment benefit to sickness because they are so NAZI on the former and the later is so easy to get (and pays more). And I really believe Labour have just benefited from good economic times. If National gets in, the numbers will jump up with all the job losses of late and National will get the blame once again. Infused with pure crapola on both counts: SB and UB rates are identical and SB requires a medical professional to approve. infused the SB isnt ‘more’ than the UB. The only ‘advantage’ is that you dont have to look for work. “To the list I’d add people of any race, social status or religion, who passing as a â€˜beneficiary’ cheats the new Zealand taxpayer by being a bludger.” – wtf? Are you saying that there are certain people of various religious/ethnic/social backgrounds getting an easier time while on the benefit? are you saying that certain religious/ethnic/social backgrounds somehow qualify one as a bludger (or that they are culturally/geneticly/socailly predisposed to bludging)? Ha ha ha – and then you include the number of Kiwis stuck on the Working for Families benefit and blows your pathetic figures out of the water. Hello ants, welcome to The Standard. We look forward to many intelligent and thoughtful posts from you during your stay. Unfortunately, that wasn’t one of them. Nothing like 50% of sickness beneficiaries are malingerers. Maybe 10% are. GPs are always trying to cull those numbers. Doctors are continually pressured to issue inappropriate sickness benefits. But being pressured does not mean they issue them. The pressure gets tiresome, but the rules are clear, you have to be sick, you have to be engaging in treatment imo. WINZ cannot make the call about whther a person is too unwell to work, so when people fail to turn up for their seminars and work planning and workplaces assessments and say they are too sick, WINZ must advose them to see their GP. so the non sick person comes along saying WINZ sent them. That is misrepresenting the facts. WINZ must advise them to seek medical review if they arent meeting the requirements of the unemployment benefit. WINZ arent telling doctors to put people on the sickness benefit, and they never have. The unemployment figures in Nz are hidden in a plethora of pointless ‘training courses’ that will never lead to anything, but keep the kids off the street. SB isn’t ‘easier’ to get. SB isnt more money than UB or IB. Some people want to be on SB because they cannot be bothered working. And cant be bothered going to three weeekly seminars and work planning and work trials. But if they are fit they should be on UB and should be planning to work. There is a category of people that will never ever get a job. They wont get one no matter how many seminars they go do. There are some personality disordered people who will never successfully gain employment. There are a few on them on SB, but really I think there should be an unemployable benefit. There is also another group of people who have done hard physical work all their lives then in their 50s and 60s have burned themselves out are incapable of doing the work they have always done, and have no skills to pick up any other kind of work. Our society is ageist and I do know several not retirement age but not employable people on the SB who would far rather be working but no one wants them. Invalids Benefit is very hard to get, you have to be provably permantly disabled in a major way. That can[t be faked. Or easily obtained. WINZ MUST recommend medical advice if people say they are too sick to work, but that is nothing like saying WINZ are pressuring doctors to put people on SB. The initiators of this process are solely those people who choose not to work and say they are too sick to. Not the department. The department advise them quite appropriately to seek a medical opinion. IB is easier to get on now than it used to be, but not as easy as it was before National got its hands on it in the 90s. The criteria for IB isn’t permanent disability. People who know how to work the system will have a better chance of getting on SB or IB. I don’t accept that there has been no ‘significant’ increase in SB or IB, although I accept the general point being made by Tane that there is no correlation between the changes in figures of UB, SB and IB. However I don’t think anyone has ever said that the decrease in UB is solely to one thing like the rise in medical beneficiaries. Obviously the fact that there are more jobs is the major factor, but that doesn’t mean that there haven’t been some shuffling and fiddling going on either. eg I don’t trust that the long-term UB numbers have decreased in a meaningful way because if you make UB harder to get and stay on then you will increase the number of people that move between UB and short-term or part-time work and who will no longer be classified as long-term unemployed even though to all intents and purposes they are. The only way we can know how many people have shifted from UB to SB or IB (or from DPB to IB for that matter) is if someone analyses the actual people involved and what’s happened to them over the last decade. Simply comparing numbers is too blunt an instrument. The thing that concerns me about Collins, and this discussion, is that there seems to be no account taken of the increasing number of people whose health is deteriorating because of long term poverty and are either on the dole where their health problems aren’t acknowledged, or are on sickness and being given a hard time for it because they’re not ‘really’ sick. I’m not sure who Collins meant when she said GPs were being bullied (i.e. who is doing the bullying? ), but if someone on the dole has decreasing health then good for them if they make it onto SB. The situation for IB in particular is that a number of people who were LTE were found to qualify for IB when programmes like Jobs Jolt came along to specifically address LTE. Whilst it would be accurate to say people have gone from UB to IB etc these people would have always qualified. That said, Winz staff have often gone to existing beneficiaries and given them the forms for their GPs in order to ensure they are receiving their full entitlements. This includes SB/IB forms regardless of whether the beneficiary is sick or invalid. Historically or recently? Why would they do that? “?Next it will be solo mums and Maori.? And why not? To the list I?d add people of any race, social status or religion, who passing as a ?beneficiary? cheats the new Zealand taxpayer by being a bludger. ARGH why do people think this!? Only about 10% of people on an unemployment benefit at the start of a year are on it at the end of the year. THERE IS NO SUCH THING AS THE DOLE BLUDGING MINORITY THAT EXISTS IN EVERY TORY’S FANTASY WORLD.